This is the secure order form for the bal-laced and plain dress instep Dehner stock / "Ready to Wear" Motor Patrol boots. If you'd like to order custom made to measure Dehner motor patrol boots, please click here to go to the specific order form for the made to measure boots. Don't worry if you forget something. You can send follow-up email to us anytime at . Measure your feet and order boots the same size as your feet... not necessarily the same size as other footwear you have. Measure your calf circumference over breeches/pants to be sure your legs will fit into the boots. Click here to see our chart of boot height, standard calf measurement and heel measurement for each size of boot. Make sure your calf is not too large for the boot... the shaft will NOT stretch and you won't be able to get the boots on if your calf is larger than the shaft. Order the one inch larger shaft or custom boots for a large calf. Do your heel measurement to ensure you'll get a comfortable fit at your instep. This also ensures that you'll be able to get your foot into the boots... important for the dress instep boots since there is no adjustable lacing. If your heel measurement is larger than what's shown in the size table for your size, you will not be able to get your feet into the boots. Click here for detailed advice on sizing. Dehner boots, unlike many boots, run exactly to size instead of running slightly large. They are lasted on a dress shoe last and fit like a dress shoe. Click here to see a chart of boot height, standard calf measurement and top measurement for each size of boot. Make sure your calf is not too large for the boot... the shaft will NOT stretch and you won't be able to get the boots on if your calf is larger than the shaft. As they break in, Dehner boots will drop or shorten about ¾" (2 cm) in height as the ankle area flexes and develops creases. 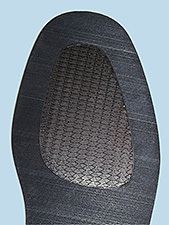 Boot in sizes 7 - 13 in D, E and EE widths are normally kept in stock and can be shipped quickly. If we're temporarily out of your size, it takes anywhere from a week to 8 - 10 weeks depending on where the next boot in your size is in the production cycle. We reserve a pair for you which is already in production at the time of the order, so it can be shipped as soon as it is finished. C and EEE width boots are not kept in stock and must be made to order. This takes about 8 - 10 weeks. Price is the same. Boots in sizes 8 - 12 in D and E widths are normally kept in stock and can be shipped quickly. If we're temporarily out of your size, it takes anywhere from a week to 8 - 10 weeks depending on where the next boot in your size is in the production cycle. We reserve a pair for you which is already in production at the time of the order, so it can be shipped as soon as it is finished. C, EE and EEE width boots are not kept in stock and must be made to order. Left is the standard Dehner Nitrene sole. Middle is the optional Vibram #100 heavy lug soles and right is the optional Vibram #430 mini-lug soles. 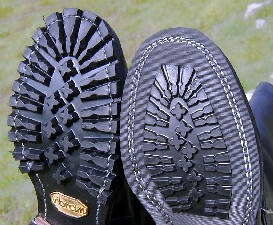 Vibram photo shows the soles on Wesco boots. The Dehner boots do not have that white thread. When the Vibram #430 sole is viewed from the edge, the lugs do not show. The Vibram sole option is a special order since boots with this option are not kept on the shelf. Dehner takes the next pair of boots in your size coming through production and finishes it with a Vibram sole. If there is a pair close to being finished this will take about a week before your boots will shipped. If they have to start a pair of boots from scratch, it can take up to 8 weeks. That's why we say 1 - 8 weeks production time. The base price of the boots is still $495 and the Vibram option adds $64 for a total price of $559. Dehner also offers a version of these stock/ready-to-wear motor patrol boots made entirely of the Black or Brown "Voyager" or Black "Wayfarer" cowhide leather. These boots are not kept in stock. They are a special order / customized version of the boot which takes about 8 - 10 weeks to build. These boots are made entirely (both foot and shaft) of the "Voyager" or "Wayfarer" leather. By contrast, the standard version of these boots has a Black Voyager leather foot and a shaft exterior made of man-made Majilite material for ease of care. All versions of these motor patrol boots are fully leather lined. 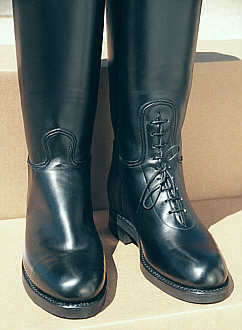 These boots are made to the same dimensions and pattern as the standard stock boots made from Black Voyager and Majilite. If you need changes to the design or dimensions of these boots, please order the custom made to measure version. The "Voyager" and "Wayfarer" cowhide leathers are heavier than either Calfskin leather or the Majilite and stand up better in heavy use. This version of the boot, like the standard Voyager leather and Majilite boot, has heavy, stiff cowhide lining in the boot shaft and supple elkskin leather in the ankles for flexibility.